If you are planning to renovate your home soon, then we know what exactly can be your cup of tea. It is time to pick up your favorite colors and get ready to paint your heart out with none other than a latex paint sprayer. Gone are the times when paint rollers or brushes dominated the market, what we have for you now is finally going to make your DIY dreams come true - the best latex paint sprayers. 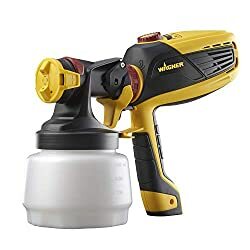 A great product, latex paint sprayer give instant results with their four basic components namely wand, hose, gun tip, and filter. A wand and hose offer greater flexibility. This means you can stay within your comfort zone and spray paint not only on the smooth surface but all the curves and corners at any height. On the other hand, different-sized gun tips with the filter take care of the blockage and disruptions. However, it is not necessary for each latex paint sprayer to have a gun tip, but all the latex paint guns promise shiny surfaces from head to toe. To know more, read this article and find out about the five best latex paint sprayers for people on a budget. Not only this, but we have also included buying guide, as well as pros and cons for each product. We are sure this article will help you in latex paint spraying purchase. Graco Magnum X7 has everything to make it your number one priority. Whether it’s your fences, ceilings, exterior sidings, interior walls, or simple projects, you can easily cover the whole surface with this brilliant airless spray paint and that too with just a single coat. You don’t have to worry about creating a mess because this long-lasting sprayer comes with a stainless steel pump that enables you to paint at high pressures. In fact, you can manage the pressure according to the texture of surfaces so that your paint flow remains even and smooth. Also, to make things convenient, thinning paint isn’t necessary before spraying anymore since this sprayer already gives out unthinned paint. Moreover, Graco Magnum X7 consists of a metallic spray gun with an additional reversible tip. In case you experience a blockage, you can simply overturn the tip in order to remove the excess of build up. This allows for better cleaning and smooth finishing touches. The response from users is overwhelming, as most praised the value it offers for their money. Most also claim that it is easy to use latex paint sprayer that is a perfect fit for regular users. However, there are a few complaints about clogging as well. Wheels are present for easy transportation. No thinning of paint required. Best quality airless paint sprayer. Heavy weight can be an issue for some people. You have to deal with over spraying. There is no valid reason to not to try this one out, especially if you are a beginner and painting your home for the first time, as it is very easy to use. 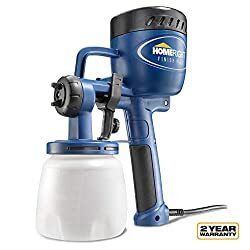 The HomeRight Finish Max paint spray gun is a budget-friendly latex paint sprayer that will not leave a dent on your pocket and provide you with a smooth, evenly layered painted surface. Since there are no air compressors or hoses, this HVLP paint sprayer will make painting much easier and quicker. Even though this sprayer is not compatible with heavy-duty painting jobs, it’s more than capable of updating and recycling furniture, ​kitchen cabinets, painting projects and transforming them into works of art. This paint sprayer has a durable brass spray needle but a plastic body. Therefore, you need to handle this product with care to make it work for the long term. On a positive note, the plastic body makes it very lightweight, about 3.4 lbs only, and also fits comfortably in the user' hands. This means you can use it for longer duration ensuring that there isn't any back, hand or wrist fatigue. It also has a tight seal and foam splash guard to avoid any leakage and minimal over-spraying. Another aspect of this HomeRight Finish Max paint sprayer is its adjustable spray control which provides horizontal, vertical and circular spray pattern to reach any corner and crevice giving you the perfect finish at home. This sprayer will ensure a smooth finish, leaving your painting projects looking brand new. It comes with a detachable cup to hold the paint and therefore, it is extremely easy to clean up. This product also comes with a two-year limited warranty and thus, is a very good option compared to other paint sprayers available in the market. The overall response is more than positive. However, this is a small but handy latex sprayer designed to do small jobs, so not for big jobs. Overall, not a good fit if you want to paint your entire home or house. If you want an affordable option for small painting jobs, the HomeRight C800766 Finish Max Paint Spray Gun is just the right option. Wagner Control Spray is an HVLP sprayer that is known to be the best one for beginners. With its low budget and easy to use features, this spray has made the painting experience a lot more enjoyable and favorable for its users. Wagner Control 0518080 can effortlessly manage the viscosity of multiple liquids which in return yields polished surfaces. Particularly, the HVLP turbines enable you to handle the consistency of thin and thick fluids. Furthermore, you can use this sprayer for multiple purposes as there are three options to alter the spraying patterns. To make use of them, you have to fix the air cup with the nozzle in three different positions. Have a look at these three patterns and choose the one you are comfortable with. Set your air cup in a horizontal direction to get egg-shaped patterns at higher elevations. If you want elliptical patterns with a large width, then adjust your air cup vertically. For uniform circular patterns, place your air cup diagonally. In addition to different spraying patterns, you can also control the air pressure system with respect to your requirements. By keeping the pressure range from 1.50 PSI to 2.63 PSI, you can reduce the chances of over spraying to a greater extent. Even though it is an affordable option, some users rate it as a decent sprayer that is little short of being great. Some users also complain about its slow speed. Little or no cleaning required because of the decreased overspray. Different spray patterns along with flexible pressure control. The power cord isn’t long so you may have to buy an extensible one specifically. This paint sprayer is preferably built for smaller portions, so the working speed is slower for large scale areas. The noise may get annoying at times. This is an easy to maintain decent sprayer that offers you good value for your money. It is an affordable option, so expect a decent job (not high-end) from it. Graco Magnum X5 is among the best airless paint sprayers available at an affordable price. It is almost similar to the Graco Magnum X7 in terms of performance and durability. With its metallic SG2 gun, you can cover many larger areas including your garage. The tip of the gun is about 0.015” inches. Being reversible, you can swiftly switch the sides of the tip and remove the blockage caused by thick materials. 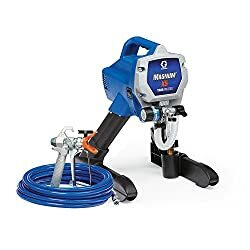 Moving on, there is an adjustable suction tube that enables you to spray paint directly from the bucket within the range of one to five gallons. Not only this, but Graco Magnum X5 also includes the stainless steel piston pump for producing unthinned paint at high pressures. From the additional adjustable pressure control, you can get your desired paint flow. The high-quality motor of this sprayer is capable of generating about 3000 PSI pressure. When the power flush adapter is connected to the garden hose, the cleaning process afterward becomes considerably easier and quicker to perform. You don’t have to move much because the garden hose does the job for you! Coming to its weight, this airless sprayer weights approximately around 20 lbs. It doesn’t have wheels to support its bulky weight, and this is why you may feel repulsive towards buying this. However, this won’t be a problem if you are only willing to carry a small scale and light home projects. To make things more interesting, this paint sprayer also comes with a manual full of instructions. The initial set up and the working procedure is explained in detail, so it’s all good especially if you are a starter. Some users complain that it was hard to keep the tip from clogging, while a few also struggled to work with low pressure. However, the overall feedback is more than positive. Can withstand long term projects with ease. Ten feet hose makes it portable and mobile. No wheels to support its heavy weight. Could be used for small scale tasks but its heavy built is suitable for large scale work only. This one makes a good option for large scale projects, and that too for an affordable price. Overall, it makes for one of the best airless paint sprayers. Ultimately designed with two nozzles and an additional cup, this paint spray gun is well adjusted to keep your exterior and interior surfaces polished with latex paint. Although this paint spray gun is conventional, the built-in features aren’t any less than modern advancements in paint sprayers. With Wagner 0529010, altering the spray pattern becomes straightforward. You just have to spin one of the nozzles, and in fact, it even allows you to change the length of the arc. The comfort level provided by this paint sprayer is unbeatable because of its light body weight of 2.1 lbs and simple start-up procedure. There is no room for confusion as you will get a guidebook with all the technical information and steps. Another point to note is the high-class control this paint sprayer gives to its user. You can fully manage the paint flow by tightening or loosening the knob present on the nozzles. To illustrate, tightening it will decrease the paint flow and loosening it will increase the amount of paint oozing out. Keep in mind to practice a little before actually pulling off the trigger of the gun. Interestingly, the perks of the nozzles don’t end here! It has a secondary option to master the finishing look. As surprising it may sound, but this feature is one of the reasons for its advanced use in painting. The detail finish nozzle can transform your furniture into masterpieces. Most users praised this product for its effectiveness for exterior surfaces. However, some raised concerns related to overspraying. Can handle denser liquids like latex. Diverse spray patterns for convenience. Remarkable at giving crystal clear finishing touches. Flexible power dial for controlling airflow. It is necessary to read manual carefully before operating this paint sprayer. Clean up required due to overspraying. This one makes a perfect option when it comes to exterior use. A lightweight and affordable option, these compact latex paint sprayer is very convenient to use as well. Amongst the different paint sprayers for latex, it can be confusing to choose the one that ideally fits your criteria. This is why it is necessary to have complete knowledge regarding the budget and functionality of paint sprayers. For this purpose, we have listed down the basic factors you need to know before buying and using a paint sprayer. Not only you will find out the benefits of using latex paints, but this ultimate buying guide will surely make your latex paint spraying purchaseeasier. Why Should You Use Latex Paints? To start with, are you wondering why latex paint is superior to oil and water based paints? Why should you prefer latex paint sprayers when there are alternatives claiming to give equally perfect results? The answer to this lies in the benefits of latex paint. The points below can convince you on how incomparable latex paint sprayers are. Latex paints are made of chemicals that are less harsh and more environmentally friendly. Their simpler formula makes them safer to use, but still, it is advisable to cover your eyes and nose to stay away from inhaling the fumes of latex paints. As such, they don’t serve any serious harm to the environment and therefore are exemplary for painting purposes. Do you remember the strong repulsive smell of your newly painted room? It was enough to give you a serious migraine! However, you don’t have to worry about it anymore because latex paint is noticeably odor free. Also, the cleaning process is pretty straightforward as latex paint can be instantly wiped with water. No prolonged mopping with paint thinners or turpentine which can save your time in the long run. One of the extraordinary thing about such paint sprayers is that it is capable of giving luxurious shine to surfaces with just a single coat. Although paint sprayers for latex usually utilize the paint in bulk, their ability to create smooth surfaces with only a single stroke compensates for the heavy consumption of latex paint. However, the quality of paint sprayers greatly contributes toward this particular aspect. The high-quality paint sprayers for latex like airless sprayers give well defined smooth edges in relation to other paint sprayers. These paint sprayers are not just compatible with latex paint, but they can also work wonders with other types of paint including the oil-based ones. At times, you may want to use oil-based paint for better durability or experiments. Their all-in-one nature can extend your interest from smooth to rough and high moisture areas like your bathroom and kitchen sink. Now that you know why paint sprayers for latex are worth your money, let’s move on to their different types. In addition, brief know-how about them will let you operate them like a pro. To pick the best paint sprayer for your tasks, it is important to know about the different types of paint sprayers that can flawlessly carry the latex paint. The type you choose depends on how much you can invest, on what you have to paint, and your amount of experience in painting. For further information, take a look in the three types of paint sprayer mentioned below. The paint in airless paint sprayer is forced out at high pressures because of the powerful electric pump. The reversible gun tip with its own varieties makes these sprayers most preferable for professional finishing strokes. When you pull off the trigger, the tip controls the intensity of the paint coming out. Also, it helps in spreading the spray fan, which makes the entire process quicker and easier. The painting procedure is direct due to the 5-gallon paint bucket, and with little practice, you can give a new polished look to your home and gardens. However, if you are keen on saving your latex paints, then airless paint sprayers aren’t a tool to choose since they generally cause 30-40% paint wastage. Especially, while handling the exterior painting projects, you have to be extremely careful as a sudden strong wind can deflect the spray droplets which can result in an extra mess for you to clean. A smart choice is to properly cover the area which you don’t want to paint in order to steer clear from the mess. All in all, airless paint sprayers can work wonders if you have larger areas to cover. If you already have experience with painting before, then airless sprayers are nothing less than a piece of cake. 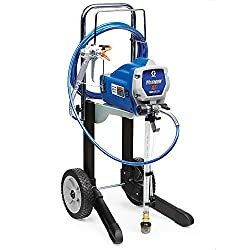 Like airless paint sprayers, compressed air sprayers also have a tip to propel the paint forward but they are a lot simpler to use. This is why you don’t really need experience beforehand with painting. All you have to do is plug in the spray gun to your compressor through the high-pressure hose. After you have established a connection, the regulator will measure the quantity of airflow, pushing the paint out. Despite its easy set-up, you have to manually blend the paint with a solvent first to create an accurate consistency required by your compressed air sprayer. Before you spray paint on your furniture, take a piece of cardboard and apply the blend on it at suitable air pressure. This way, you can control your paint flow by altering the pressure to the right value. To highlight the precautions, it is recommended to wear professional glasses and respiratory mask since the concentrated air fumes can be fatal to health. On the whole, compressed air sprayers are good for small-scale areas like your cupboards, cabinets, and drawers. With the right consistency, you can easily excel the smooth finishes at significantly cheaper rates. 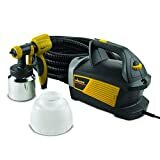 High volume low pressure(HVLP) sprayers are commonly designed for wood stain and primer but the industrial ones are also capable of handling the latex paints. The low-pressure setting makes these sprayers the best for beginners who want professional output for their interior home painting. Unlike the other paint sprayers, HVLP sprayers lack the tip and instead use a stable air volume to drive the paint onto the surface. The compressor helps in balancing the consistency of liquids and in response, the surface looks shiny and sleek. Thanks to their adjustable pressure settings, they are technically a lot safer to use. In addition, they are affordable as well but in order to use latex paint, you may have to go for a slightly expensive one. Nevertheless, if you are a beginner, then it is a good idea to start your DIY painting journey with HVLP paint sprayers. What to Look for in Your Latex Paint Sprayer? Keeping the quality and budget of paint sprayers aside, another important thing to note is your own convenience. Ask yourself that what will you mainly paint and figure out the paint sprayer for latex according to your answer. This is the major question to ponder over because the magnitude and unit of paint sprayer depends on how big or small your area of interest is. A larger exterior surface calls for a strong and heavy paint sprayer for latex that has a potential to carry an immense quantity of paint. A larger bucket also means you don’t have to waste your time on refilling your paint reservoir. Similarly, if your work is limited to small scale areas mostly, then you don’t necessarily have to buy a heavy metallic paint sprayer. In fact, a good quality plastic paint sprayer is more than enough to aid you in your household painting chores. Being light, such paint sprayer will be definitely a lot easier to manage. Regardless of what you choose, make sure your paint sprayer has an option of variable settings so that so you can feasibly switch between different spraying speeds and patterns whenever you find necessary. It is natural to hesitate while painting with a paint sprayer for the very first time. A right appliance with better quality latex paints can only give out remarkable results if you know how to use a paint sprayer. Although the instructions may vary with different types of paint sprayers, the basics however remain the same. Follow the steps below and see how fairly easy it is to use a paint sprayer. Your first step is to properly clean the area you are about to spray. Use a mild detergent and rub it gently with a scrub. After that, allow the surface to dry naturally or use a towel to wipe if you are in a hurry. Make sure to never spray on a damp surface. Once your surface is completely dry, cover the exposed surrounding parts with a spare cloth. Keep in mind to use a thick cloth which can protect the covered parts from the deflected paint particles due to overspraying. As for the tip, always start from the corners. Take your latex paint sprayer and maintain a distance of nine or twelve inches between the surface and your gun tip. A good practice is to spray your latex paint in intervals by creating equal portions on your desired surface. After you have polished the surface, leave it open for the next few hours. Luckily, you won’t have a headache because latex paints are almost odor-free. While the surface is drying, clean your paint sprayer and place it safely. That’s it. Enjoy your very own smooth looking surfaces! To conclude, the benefits offered by latex paint sprayers make them best for local household projects. Buy the one that suits your needs and enjoy your painting experience. You have the power to make your house shine clear and bright!